The same month that we tore off our old mudroom in preparation for the move (which use to be where the door/clock/purses hang in the picture below) I decided if I already had a demo pile of trash outside, I might as well add to it by tearing out the soffit in my kitchen! 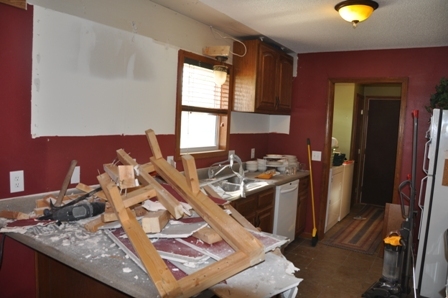 Here is what my kitchen looked like 12 month ago…. 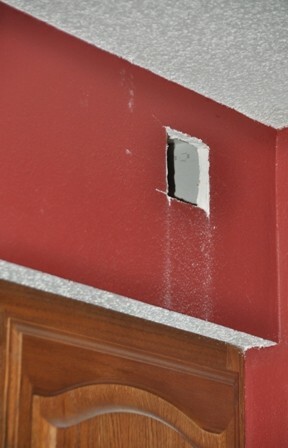 Step #1: CUT SMALL HOLE in soffit to see what you are getting yourself into. Luckily, our soffit was hollow!! 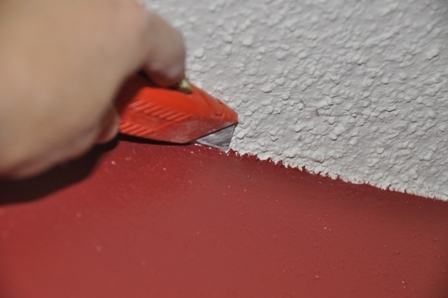 Step 2: SCORE YOUR SHEETROCK from the ceiling so you have a clean cut when you pull out your soffit. This will keep you from tearing up your ceiling! Step 3: RIP OFF THE SHEETROCK! Step 4: KEEP GOING!! DON’T GIVE UP! 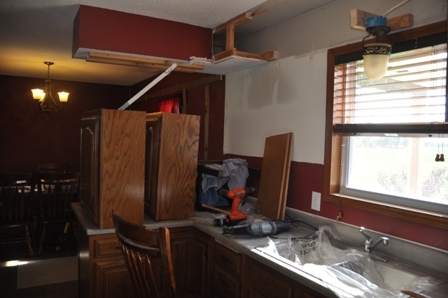 After I made it halfway across the kitchen, I removed the first cabinet (as you can see in the picture below, the white area is where the cabinet was). 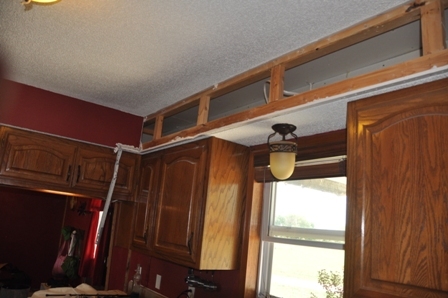 Moving the cabinets would allow me to rip out the rest of the soffit AND keep the cabinets safe from demo! How did I do it ALONE, you ask? Well, since my kids were too little to recruit AND cabinets are HEAVY, I had to get creative Ü I flipped one of our barstools on its side, wedged towels in-between the cabinet and stool, then held the cabinet in place as I unscrewed the screws with the electric screwdriver. Once I got my balance, I carefully took them off the stool and placed them in a safe spot. The idea was working, until I got a too CrAzY and wedged the stool so tight that I couldn’t get IT or the cabinet loose! 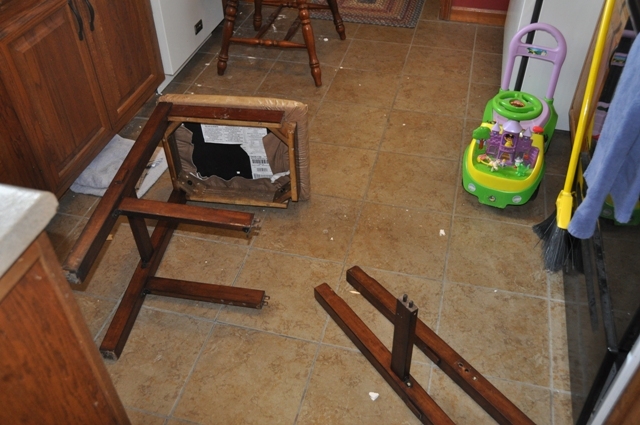 So…I ended up having to take the barstool apart. :( But no worries! I screwed it back together and it is just like new!! 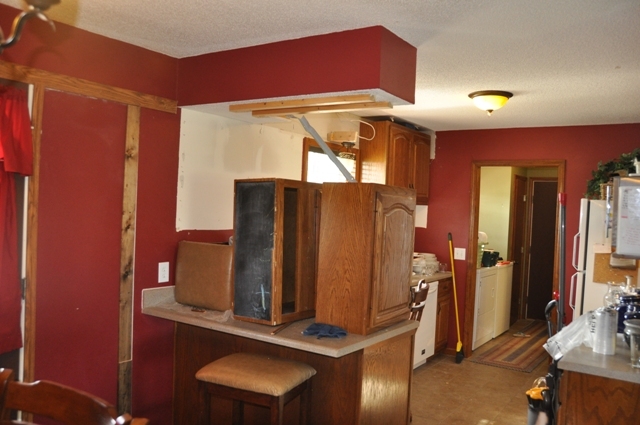 Step 6: REMOVE remainder of cabinets and CONTINUE TO DEMO SOFFIT! Don’t you agree? Look at how much it opened the room! I thought I took pictures on how I hung the cabinets by myself, but apparently I was getting tired by that point! The picture above shows the first cabinet I hung. 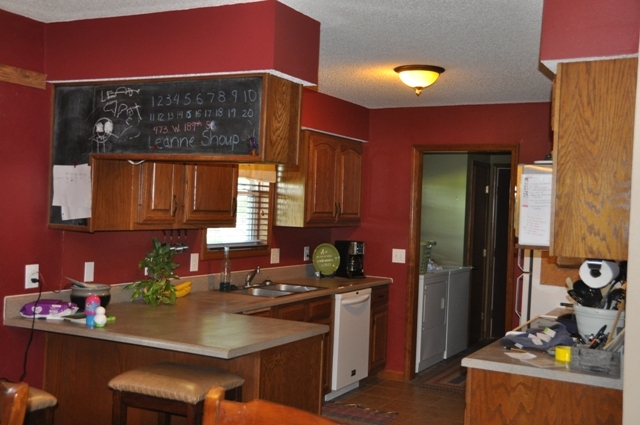 As you can see, I purposely left a gap between the cabinet and ceiling so I could add crown moulding in the future. 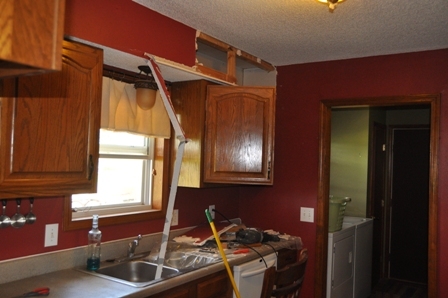 The idea of hanging the cabinets was pretty easy because all I was doing was moving them straight UP. The screws could stay in the cabinet holes because I would still hit a stud. The hardest part was doing this alone and having the strength to hold the cabinet exactly where it needed to be AND screw in the screws at the same time. I used the barstool and towels again, and to make sure the cabinet was level, I taped it to the top of the cabinet so I could see if it was level or not! My body is sore just thinking about this step of the process. It was quite the workout, but I finished!! If you want me to continue “Lara’s Home Makeover Series” comment below by telling me what you think of this kitchen project! Thanks Deb! Hope you are doing well!! Oh my god! It looks amazing! The next time Rob has anything to say about the little projects I take on while he is at work, I am showing him this post!!! Looks like you have a much bigger kitchen. By the way…we have the same light fixture in our eating area!!! I can’t believe you did this all by yourself! You are awesome! Wow wee! It looks amazing! 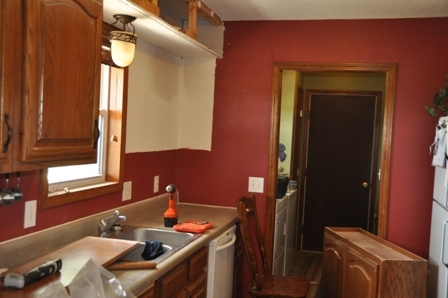 I was never brave enough to take on projects like that while my hubster was gone. Go you! Thanks Ashley!! Just wait for the upcoming weeks! 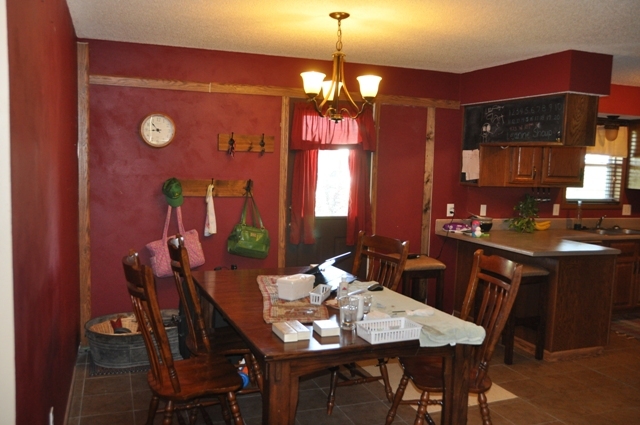 Posting these pics today, I barely recognized my kitchen compared to how it looks now! And I did it all on my own, which means anyone could do it (and on a budget too!)! WOW Where were the kids while you did this? If they were home with you, I don’t know how you did it. All the stopping to wipe noses, change diapers and fix meals. Congrats. Believe it or not, Leanne had a slight fever that day and didn’t really want to do much. I am a stickler on not letting my kids watch too much tv, but since she didn’t have the energy to play, she pretty much slept and watched tv all day. Garrett was suprisingly content with playing on his own most of the day…it was like it was meant to because most days I’m lucky if I can sneek away to switch out the laundry!! 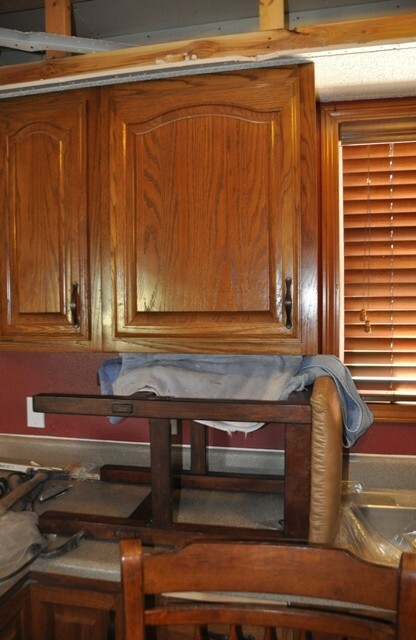 I’m still trying to convince Jeremy to let me remove the cabinets above our bar…. This is absolutely amazing! I have seen your new kitchen and I can’t believe you did that by yourself. I also can not believe you got it done in one day!! You are definitely an inspiration for all of us that are too scared to start a new project, especially if it involves major demolition! 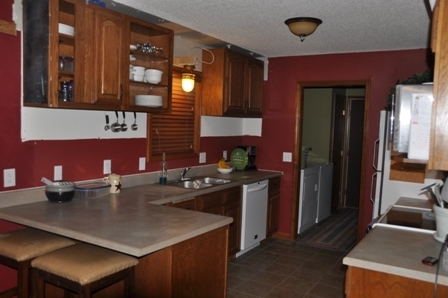 Can’t wait to see more pics of your home makeover. Is any of the structure up there load bearing?